Weekend brunches at home are usually pretty straightforward – eggs, bacon or sausage, toast or potatoes, that sort of thing. 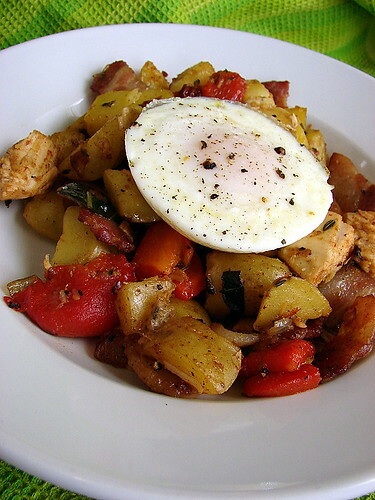 I recently ordered a set of PoachPods and was eager to test them out, and I have also been eager to try a spin on Ina Garten’s Basil Chicken Hash, so this seemed like a good opportunity to do both. We had four thick-cut slices of bacon in the fridge, so I chunked those up into about 1 inch pieces and began to cook them in in the cast iron skillet. I added two large shallots (chopped) and a pinch of salt and let the shallots begin to caramelize, then I added about two cups of boiled fingerlings, cut into chunks, and about a cup and a half of cubed roasted chicken left over from last night. I seasoned this again with salt and pepper and let it all brown. I chopped up a couple of fire-roasted red peppers and added those to the mix, along with lots of fresh thyme and basil (chiffonade). Poaching the eggs was ridiculously easy – you just bring a pan of water to a boil, crack an egg into each of the PoachPods (to which you’ve added a tiny amount of oil), then gently place them into the water, lid up the pan and let the eggs cook to the desired doneness. In about five minutes, I had perfectly poached eggs (with no messy pan to clean up), which I loosened from the pods with a spoon and placed on top of the hash. Mike said this was easily as good as similar dishes we’ve had out, and I have to agree. Plus, it’s always nice to be able to eat in your pajamas. My mouth is watering from all these delicious-looking entries. I so admire someone with the gift for cooking (and it is definitely a gift to be able to throw meals together the way you do rather than just rely on recipe books). This looks like it will be a lot of fun and shall be bookmarked instantly! Miss Merry, the poach pods are seriously fantastic. Highly recommended.